The DeGrazia Gallery in the Sun is an iconic Tucson landmark located at the base of the Santa Catalina Mountains. 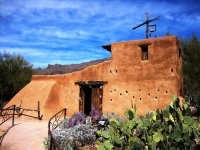 Established by the famous artist, Ettore DeGrazia, the property is listed on the National Register of Historic Places and features a museum of DeGrazia's work and an adobe chapel, called the Mission in the Sun, as well as striking murals, gardens and the artist's home and grave site. Apart from the works displayed in the gallery, the property is strewn with sculptures and art installations by the artist renowned for having captured the spirit of the Southwest. Free public tours are available, but must be scheduled in advance. Check the official website listed below for details. Admission: $8 adults, $5 12-18 years old, free for under 12.